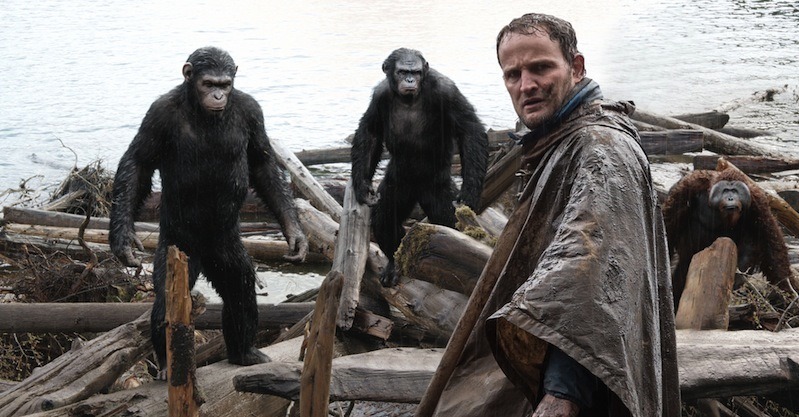 It’s rare that a sequel or a reboot manages to justify its existence in the megaplex, but Dawn of the Planet of the Apes manages to one-up its progenitor and then some. Rise of the Planet of the Apes (2010) was itself a pleasant surprise; granted, expectations were low — most viewers still had the bad taste from Tim Burton’s abortive 2001 Planet of the Apes reboot lingering in their proverbial mouths like a bag of garlic-flavored Fritos — but director Rupert Wyatt (The Escapist) wisely turned the franchise on its ear and took it back to basics. This new installment, directed by Matt Reeves (Cloverfield) takes place 15 years after the bleak ending of its predecessor, and things haven’t exactly gotten better since then. The simian flu released in the third act of Rise devastated the world, and the subsequent fighting and anarchy has all but nailed the coffin shut on the human race. As with Rise, the movie takes place in San Francisco — what’s left of it — where one of the few pockets of survivors subsists in isolation. They’re led by Dreyfus (Gary Oldman), a former soldier who lost his family to the virus and harbors a hatred for the apes, and by the more hopeful Malcolm (Joseph Clarke), who organizes a mission to restore electricity in the colony by repairing the O’Shaughnessy Dam. This involves entering the nearby Muir Woods, now the domain of the apes, lead by a firm yet compassionate Caesar (Andy Serkis). An uneasy truce is established established between the two camps, but it is threatened by hatred, fear, and distrust on both sides. The humans are clinging to the last vestiges of creature comforts behind the walls of their compound, and panic at the drop of a hat. 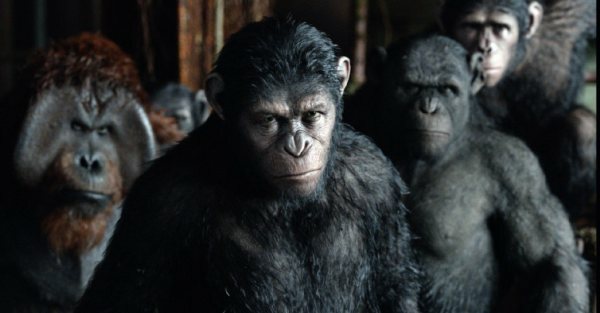 Caesar’s leadership is challenged by hot-tempered chimpanzee Koba (Toby Kebbell), whom the sage leader notes “learned hatred from humans, but nothing else.” The tension that results builds to an uncomfortably believable boiling, and it’s a credit to returning screenwriters Mark Bomback, Amanda Silver, and Rick Jaffa that twists, turns, and escalations rarely feel forced or contrived. Replacing most of the cast for this venture was a risky venture that has paid off with dividends. The actors in the Apes movies of the 1960s and ’70s often described the effort required to act through the prosthetics they wore in order to fully project their careers, and how that often influenced their performances. It’s no less different with digital make-up, and Serkis delivers what is arguably the best work of his career. With Caesar, he imbues a talking chimpanzee with so much humanity that the effect is nothing less than haunting. In comparison, King Kong is a lightweight and Gollum is a creepy-cute gimmick. The franchise has always been a social/political/environmental allegory that has worn its stances on its sleeves, and Rise is no different, though it ditches the satirical element. When things inevitably go to hell in a handbasket, everyone shares at least a bit of the blame, as well as the pathos. There’s an intriguing case study to be found here on how quickly and easily conflict can arise despite efforts to the contrary, and how one or two unchecked and determined jerks can ruin things for everyone else. Special effects wizards Joe Letteri and Dan Lemmon also return, and impressively meet the logistical challenges of generating legions of photo-realistic who now ride horses and operate firearms, blending seamlessly with Michael Seresin’s dark and often dreary cinematography. The motion-capture work, and the haunting expressiveness of the primate faces that it allows, is nothing short of staggering. Gary Dowell is a freelance journalist and movie critic who lives in the White Rock Lake area. Email editor@advocatemag.com. He blogs about movies at movieink.net.